Most of us know that Snakes are good hunters and they are the ones who devours preys bigger than their bodies. While Frogs love eating insects, from mosquitoes to giant moths, they are usually the ones being eaten by the serpents. And the domestic Cat, they love playing hide and seek with the mice or sometimes birds. The snake was caught in the middle of a frog and a cat. But things are a bit different in a video uploaded by Animal Bababa on their YouTube channel. 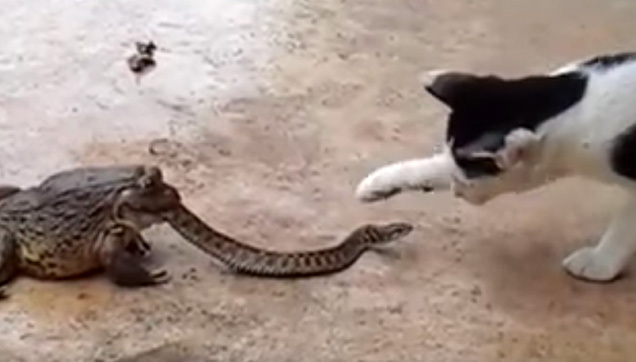 It shows a rare three way fight between a frog, a snake and a cat. The footage started with giant Frog which captured a little snake and it already started gobbling the tail part of the reptile. It slowly but surely swallowing the Snake alive. Meanwhile, the Snake seems like it doesn't care what the Frog is doing to half of its body. And from a distance, it looks like the Frog had a very long and powerful tongue moving by itself. And then a feral cat entered the scene, maybe curious of what's happening between the two animals. At first the feline tries to get the attention of the Snake, but the serpent defends itself from the Cat. The Cat fights back by tapping the Snake's head and the Frog continues swallowing the tail, putting the situation of the viper in more danger. Finally, the amphibian decided to take full ownership of its meal, so it leaps away from the Cat while the serpent is still alive, half burried in its mouth.